The picture on the left [above] shows the infant born at Cincinnati to Mrs Mary Eloise Smith, one of the widows of the Titanic disaster. The boy will be named Lucien P. Smith II, after his father, whom the young widow saw for the last time on the night of April 15, when he placed her in one of the Titanic lifeboats and bade her good-bye. His body was not among the few that were recovered. They were returning from their honeymoon abroad. The husband was twenty-one, the bride is nineteen. Mrs Smith was asleep in her stateroom when the ship crashed into the iceberg. Her husband, who was in the smoking room at the time, rushed to her room and awakened her. They reached the deck as the third lifeboat was being lowered. Mrs Smith clung to her husband, but he insisted that she should take the small boat, from which she was rescued by the Carpathia. 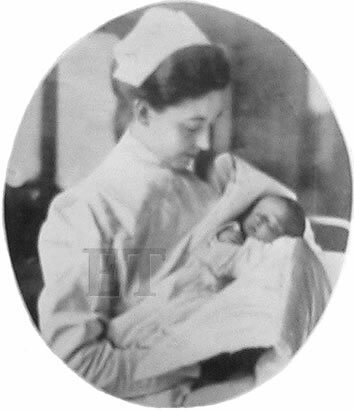 The boy, Smith II will also be Baby II as all New York has been excited by the advent of Mrs Astors baby, who, like his half-brother, inherits great riches from the unfortunate father whom he was destined never to know.